The phrase “there’s no free lunch” is over used, but bear it in mind when you see that tempting “free download” offer – whether it is a useful application or a pretty knitting pattern. If a link in an email or on a web page takes you away from the originator’s web site beware – it will probable go to a download site such as download.com, cnet.com or similar. When on those sites also look out for the big obvious download buttons, they’re often adverts and/or links for other unrelated downloads. Even if the download is from the originator’s web site check the downloaded installer carefully when you run it for dodgy defaults to install unwanted optional extras. Download files from third part downolad sites will commonly include cunning choices, terms & conditions or some other double negative confusing options to trick you in to agreeing to install some dodgy browser toolbar, browser replacement , search provider, PC “clean-up” or more nefarious malware. 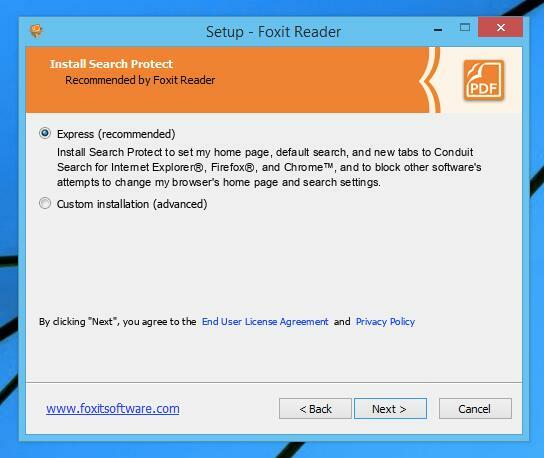 One example is the popular FoxIT PDF Reader – which has default option to install the horribly intrusive “Search Protect” and “Conduit Search”. Even so-called “trusted” providers might include a default option to install an un-wanted browser search toolbar. Oracle’s Java Runtime is a surprising example – although Java itself is a security nightmare, so only install it if you really, really need it – see this article from How To Geek. If you’ve fallen foul of malware I recommend downloading and installing Malwarebytes Anti-Malware from http://www.malwarebytes.org. It’s free to run a scan and has a free trial of Premium which runs in the toolbar to keep an eye out for intrusions and to block them. If that doesn’t completely clean things up then I also recommend running a scan for a form of malware known as adware using AdwCleaner from http://general-changelog-team.fr/en/tools/15-adwcleaner and use the link to their own ToolsLib site – but beware of getting it from other sites for obvious reasons! So the bottom line is if in doubt just don’t download and don’t click on the default install.